ChiIL Mama : The Actor's Gymnasium-Winter II Session and Lost & Found returns! The Actor's Gymnasium-Winter II Session and Lost & Found returns! This February, Lost & Found: A Recycled Circus returns to The Actors Gymnasium. Back by popular demand, this family-friendly show opens February 11th, and features some of Chicago's finest circus talent. Tickets are on sale now! Get yours before they sell out. ChiIL Mama's GRREAT GREEN SEAL OF APPROVAL: 99% Recycled! - Costumes, props and set pieces used in this show are re-purposed, recycled, found-object art. Last year's runaway hit, Lost and Found: A Recycled Circus, returns to The Actors Gymnasium. A collaborative original work by Co-Artistic Directors Larry DiStasi and Sylvia Hernandez-DiStasi together with an amazing team of designers and performers, this circus production explores the world of second-hand treasure. Cast-off junk and cast-off characters are saved in this show and given thrilling, new life. 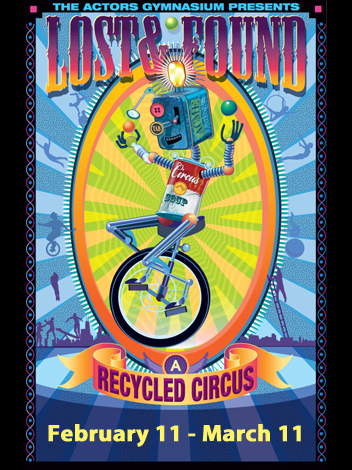 Lost and Found: A Recycled Circus features aerial acrobatics, live music, and magical, found-object invention. This year the cast features Zoe Boyer, David Catlin, Will Howard, Chris Mathews, Will McGowan, "Tommy" Tomlins, Lindsey Noel Whiting, The Actors Gymnasium Teen Ensemble and some amazing young performers. View the video trailer for Lost & Found: A Recycled Circus, here. The Opening Night Gala is our annual celebration of community and a way to support the need-based financial aid programs of The Gym. Fabulous food! Cool raffle items! Seating and capacity are limited and tickets are going fast! Get yours today. For more information, click here, or call 847-328-2795. The Actors Gymnasium is dedicated to bringing a new physicality to the American Theatre. Encouraging ground-breaking theatrical exploration, The Actors Gymnasium teaches circus arts, physical theatre and multi-disciplinary performance to children and adults; produces original, daring works of circus-theatre; and serves as a talent resource, providing performance opportunities to our students and innovative event entertainment for a wider audience. At The Actors Gymnasium, people Learn To Fly - physically, emotionally, intellectually and creatively. 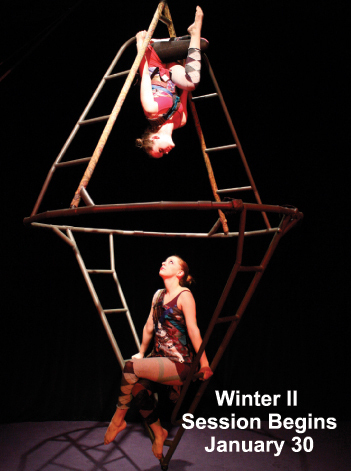 Registration is now open for Winter II session! Classes for both adults and kids begin on Monday, January 30. Don't miss this opportunity to register now before classes fill. If you have any questions about any of our programming, please email email@actorsgymnasium.com, call 847-328-2795, or stop by the office in the Noyes Cultural Arts Center.